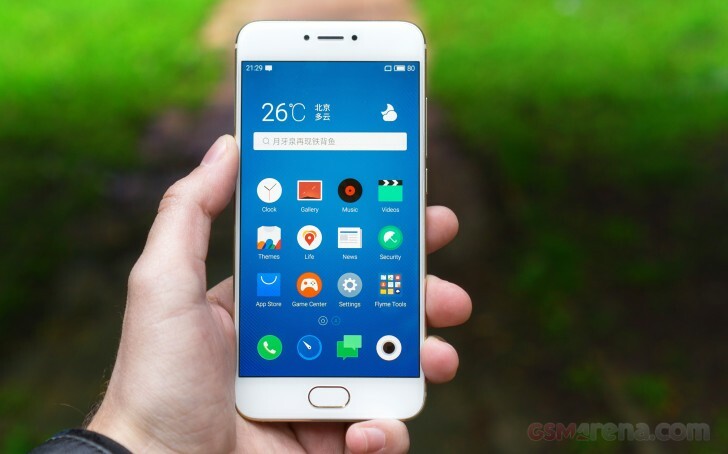 The Meizu Pro 6 runs on the latest Flyme 5.2 OS, which was built on top of an Android 6.0 Marshmallow core. The Flyme OS 5 lockscreen is a pretty simple affair - you drag upwards to unlock and have the option of securing it with a passcode, an unlock pattern, or use the fingerprint reader (it's not always-on, sorry). There are no shortcuts on the lockscreen, but you get a quick access to the camera. Gesture wake up is available - you can use pre-defined gestures to launch different apps while your phone is asleep - double tap to wake and swipe to unlock work by default, but you can also use swipe down, or other gestures such as Z, M, U, W, among others to launch apps of your choosing. The homescreen is simple - you get two panes by default but you can add more later on. The homescreen gathers all of your app icons and you can add widgets into the mix. The notification area pulls down the whole way. You get a set of four circular toggles for various settings and you can expand them with a swipe down or with the dedicated virtual button in the top right. Switching between tasks is done with a pull up menu from the bottom of the screen. The task switcher has been completely overhauled in Flyme 5 - it's now a 3D scrollable carousel and there is an option to close all active/suspended apps. The option to pin an app (tap and hold) is here to stay - the pinned app will stay always in recent apps at the state you closed it. Flyme 5 supports multi-view, which is also managed via the task switching interface. The supported apps have a 'Multi' button and you can activate a split-screen app right away. Unfortunately, the apps to support multi-view are only four - News, Video, Settings, Documents and Smart Voice. Hopefully this list will grow bigger with the upcoming firmware updates. You can customize the UI with various themes. You can browse the App Center for themes - some of them are paid but there are many free and a lot to choose from. There's also a variety of built in wallpapers. There's a Do Not Disturb mode that will block notifications and calls and you can choose a white list of numbers that can get through. It can be scheduled to run at specific time intervals or be set manually. There is one more option - Scheduled Power On and Off - you can setup your Meizu Pro 6 to shut down and boot up at a specific time on specific week days - just like alarms. The Pro 6 isn't as big as its Pro 5 sibling, but Meizu still provides a way for single-handed operations with the so-called Smart Touch. It's a movable virtual 4-way key, like a D-Pad, and you can assign functionalities to each of the directions, tap and hold, tap, and double tap. For example, moving the key downwards brings down the notification area, moving it towards right acts as Back. If configured properly, it can very much allow you to control the metal with just one hand, while you are on the move. Flyme OS can be tough to get around at first but once you've gotten your bearings it becomes a treat to work with. Meizu is keeping things as simple as possible and everything works seamlessly without any hiccups.